100% Pinot Noir, 45+ year old vines, from grand cru vineyards in Bouzy. Aged ten+ years on the lees. Dosage: 6 g/l. This is bottle no. 6359. Nothing burnished here; this is a shimmery yellow-gold. Tapered, indeed beneficent for powerful Comtesse, a tête de cuvée more synonymous with Bouzy’s overt flavor authority. Such a fine bead of acidity, casting a complex web of myrtille, brown spice, bush tea, bermuda hay and toasted brioche in dynamic relief. 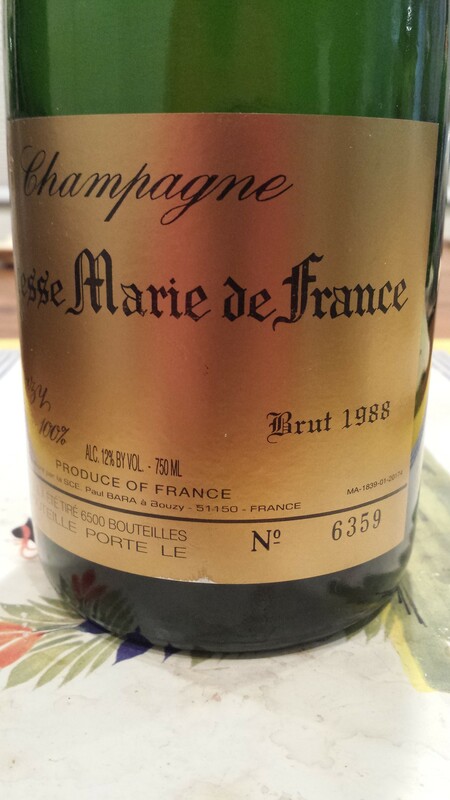 Quite nerveux for a wine of twenty-seven years! The finish is declamatory as Bouzy, where darker, earthen notes of forest floor, peat and fungi comingle. Aging with grace, with more stories still to be told. Now – 2020+.